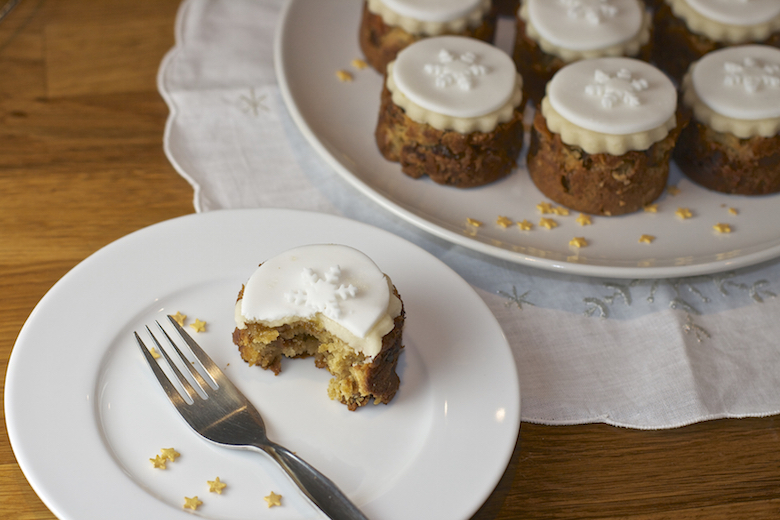 A fast Christmas cake recipe for when you forgot to spend two months making one. I’m of a mind that life is complicated enough without feeding a booze soaked cake from October 1st every year. These mini models only require fruit to be soaked overnight and the traditional marzipan and white icing topping is an easy minimal version too. Hence when Great British Chefs asked me if I’d like to come up with an alternative to the traditional needy candied peel fest for their collection of recipes working with Urban Fruit I knew just what I’d make. Dark rum is the alcohol used in this alternative Christmas cake but you could use brandy or a Malibu style coconut flavoured spirit instead. 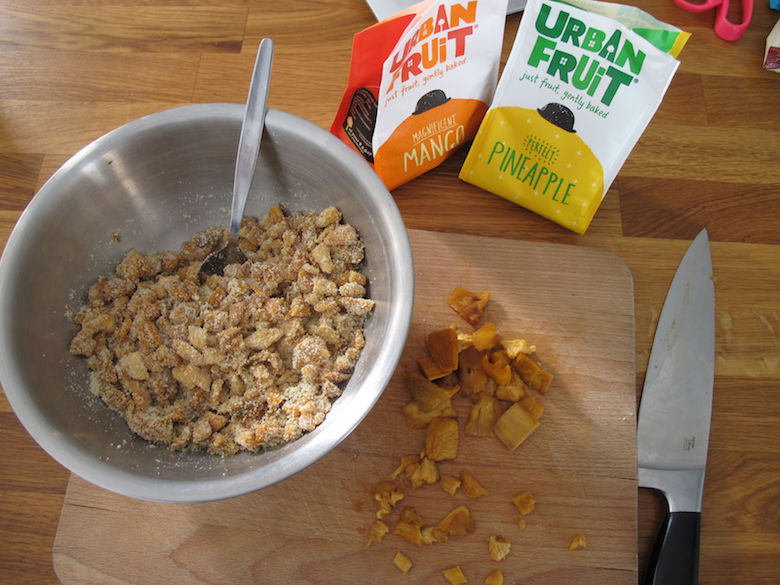 There are no whole nuts or candied peel, just dried tropical pineapple and mango. The dried fruit is soaked to pulp it up again then patted dry and coated in ground almonds and coconut to help prevent it sinking to the bottom as the batter bakes. Cutting the fruit into small dice also makes the individual pieces lighter and less likely to sink. You see I don’t have an aversion to traditional Christmas cake, I love it. I just can’t be bothered to make one. So what I came up with was a 24 hour version that you could knock up on Christmas Eve if you needed to and they’ll keep throughout the holiday period to feed those pesky unexpected guests. You could even box up individual ones and give them as informal gifts or party favour. Result! Armed with a crate of Urban Fruit’s extensive range I zoomed in on mango and pineapple pieces which I thought would pair nicely with my spirit of choice – dark rum. The fruits are free from any extra oils, sugar or sulphites and smell incredible when you open the bags. Just fruit, gently baked as they say at Urban Fruit. I soaked the mango and pineapple pieces in dark rum, drained, patted them dry then coated them in ground almonds and coconut. Although I’ve got to say having chomped our way through some of the other varieties, the strawberry pieces are out. of. this. world. Imagine nuggets of concentrated strawberry jam. That’s what they’re like. If strawberry jam was available in tablet form for self medicating, this is what it would be like. The best tin to use for these cakes is a mini Victoria sandwich tin (sold at Lakeland) rather than a muffin tray because these give taller mini cakes with straight vertical sides. But you could use a normal large muffin tray if you didn’t have one of these. For tidy tops, use a serrated knife to level the cakes off. Alternatively, if you do not wish to do any decorating you could eat them scone style (maybe spread with brandy butter) instead. After lopping the tops off, you could “feed” this cake with some of the sugary drained rum if you wish. Since it’s smaller and not completely covered in icing, this isn’t the type of Christmas cake to keep for months like a traditional one. But up to a week in an airtight tin should be fine. 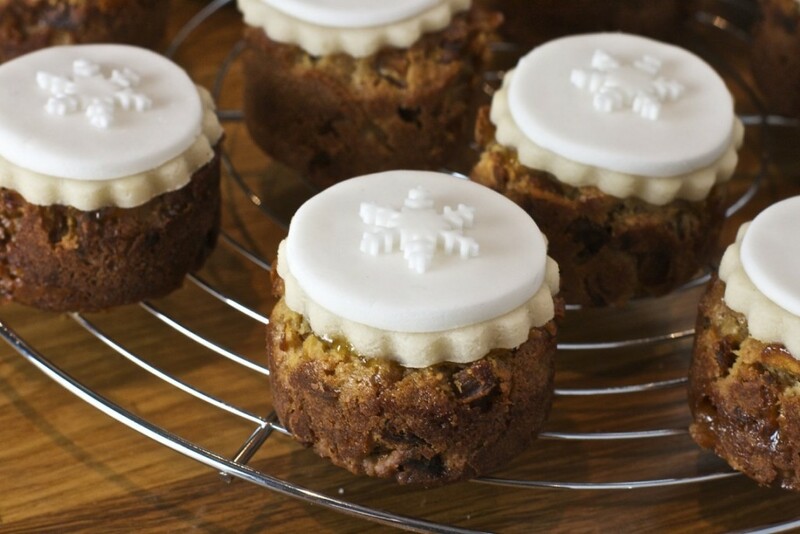 How do you get on with making Christmas cakes? Are you a start early and soak person? Or do you scoop up a £5 Mary Berry in box kit from Tesco? You will need a greased 12 hole mini Victoria sandwich baking tin (or a muffin tin), small snowflake cutter, round and crinkly cutters to fit your 12 hole tin. 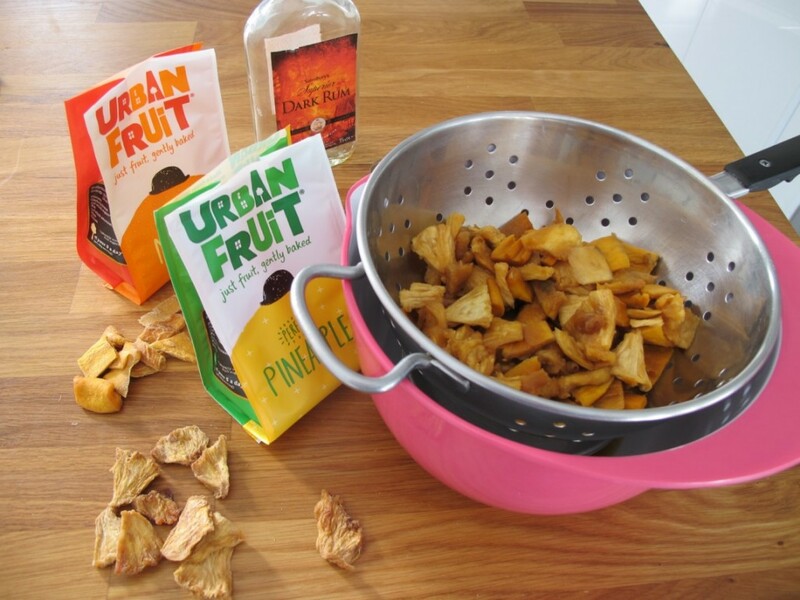 In a mixing bowl, soak the Urban Fruit dried mango and pineapple in dark rum overnight. The next day, preheat the oven to 160c/ gas mark 3. drain the fruit thoroughly and dry carefully with kitchen paper. Chop the mango and pineapple into small dice and in a small mixing bowl coat thoroughly with the ground almonds and coconut. Take 175g of the marzipan and cut into 1cm dice. Wrap the rest in clingfilm and set aside. 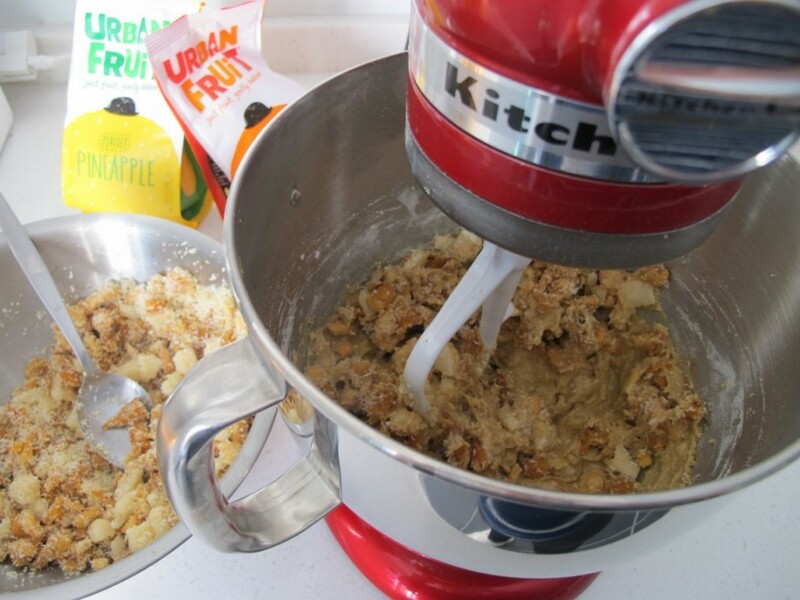 Using an electric mixer, cream the butter and sugar together until light and fluffy. Beat in the two eggs until smooth then beat in the plain flour, ginger and vanilla extract until just combined. 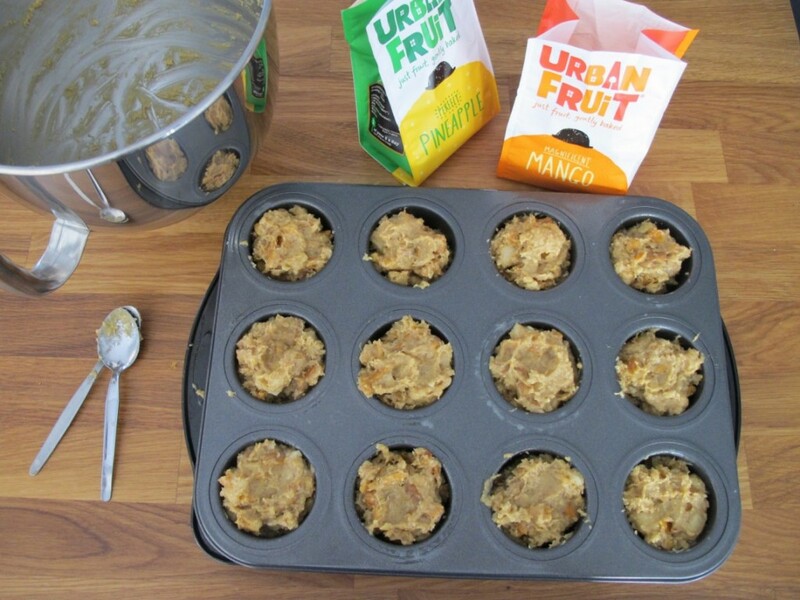 Mix in the fruit and nut mixture and when folded through decant spoonfuls into the 12 hole baking tin. Smooth the tops of the batter so the tops are flat-ish. Allow the cakes to cool in the tin for a few minutes then remove carefully and transfer to a wire cooling rack to cool down completely. 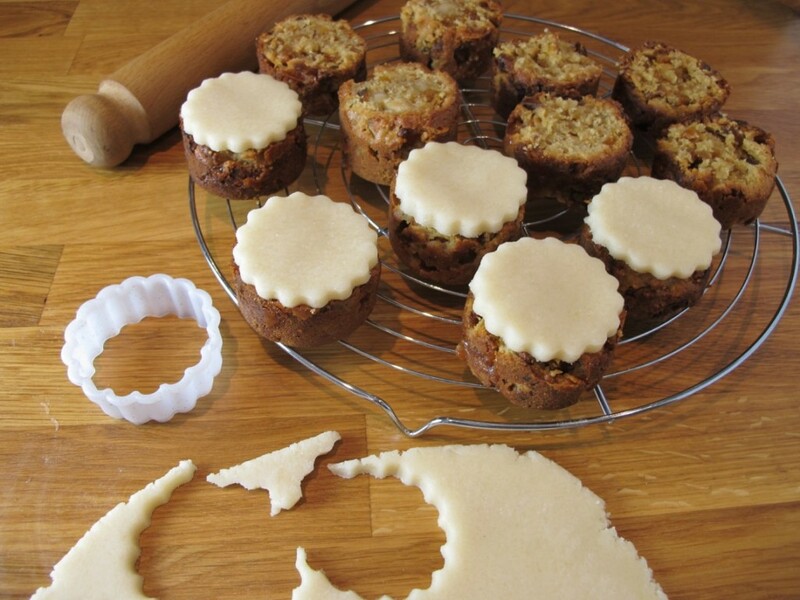 When the cakes are completely cool, use a serrated knife to level the tops. Knead the remaining marzipan and roll to 5mm thickness. Cut out circles of marzipan with a crinkly round cutter. Warm the apricot glaze for a few seconds in the microwave and spread blobs on the tops of the cakes to “glue” down the marzipan circles. Smear a little more apricot glaze in the centre of the marzipan circles ready for the sugar paste topping. Next roll the sugar paste to 5mm thickness and cut out circles to top the marzipan. Finally stamp out the snowflakes and affix these to the sugar paste cake tops with a drop of water. The cakes are now ready to serve. 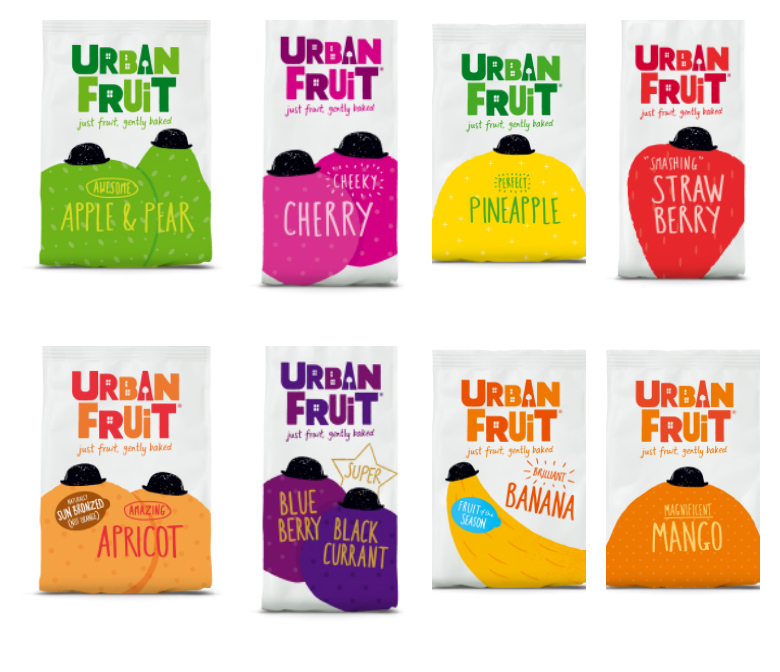 Post commissioned by Great British Chefs as part of their campaign with Urban Fruit. 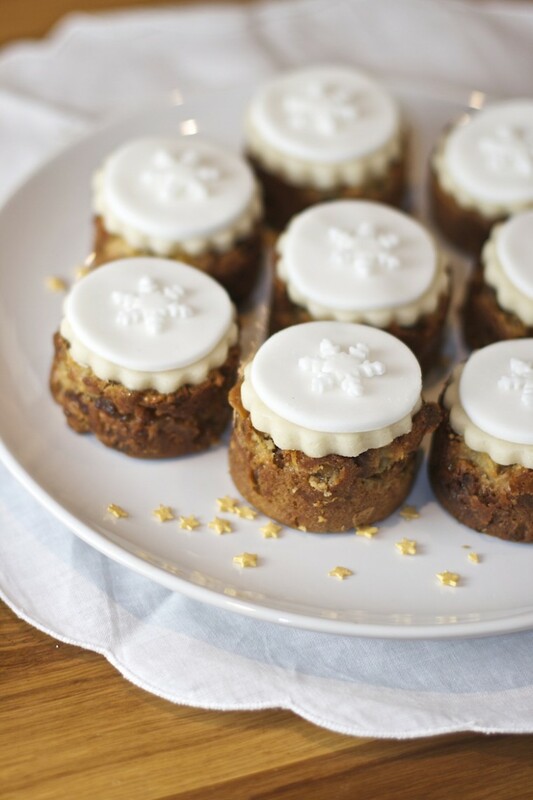 These Christmas cakes looks so amazing! I love their small size especially and can’t wait to try them. Thanks so much for sharing!